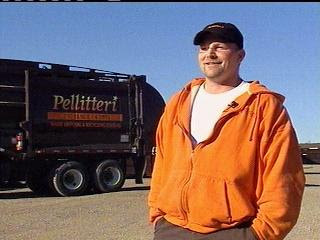 MADISON, Wis. - A garbage truck operator is being hailed as a hero for finding $10,000 worth of diamonds that had accidentally been thrown away. "We got a call from a customer that had some earrings in the garbage," said front-load truck operator Ron Lund. At Pellitteri Waste, where Mr. Lund works, those types of calls come in about once a month so he really wasn't surprised, though these were no average earrings. They were $10,000 diamond earrings from a local jewelry store, WISC-TV reported. What surprised him is he actually found them! "I'm thinking, 'No way, I'll never find them,'" said Lund. "I told them, 'Good Luck,'" he laughed. On his route, Lund picks up garbage from more than 130 businesses, including the jeweler. "I was thinking, 'Little diamonds versus 30,000 pounds of garbage,'" said Lund. "No way." But, those little diamonds got him looking. "I kind of knew where the store was on the load," said Lund. "So I drove forward to lay it out." "I grabbed a bag and started looking in there and that's where I found them," said Lund. "I found one first then I thought the other's got to be in the bag, and I found the other one." It took him a total of eight minutes. "I was just surprised I found them," said Lund. "I'm surprised anybody would find them." The business owner gave him an $80 reward. Lund said that he decided to try his luck again. "I already spent it," he said. "I went and bought Powerball tickets. I figure I found the earrings, I'll buy the tickets and maybe I'll get lucky." Lund also admitted he once dumped all his keys into the garbage, and was lucky enough to find them, too. What a very remarkable deed (..and luck!) done by Ron Lund! Who would have thought you could find something tiny and valuable in heaps of trash. What I did not like about the incident though, was that the company only gave kind, hardworking, and honest Mr. Lund only 80 bucks. I mean, for something worth $10,000? They could have at least given him a thousand, 500, or even just make it a hundred. I just think he deserves more than 80. Surprisingly, amidst all the surprises, Mr. Lund was happy about it and bought himself Powerball tickets. I commend Mr. Ron Lund for a job well done, not only being honest, but someone who does good without asking for anything in a return. Ron Lund, you are a true hero and a fine example for us all!